"Most of the time, drones aren’t exactly at home in the water. And those that are tend to be limited to staying below the waves. That’s where a new project carried out by researchers at Imperial College London hopes to shake things up. With their prototype AquaMAV robot, the researchers have created a winged aerial drone not only able to fly in the air, but also to dive into the water and then re-emerge. 'We’re developing a fixed-wing aircraft which can move in both air and water, and transition between the two quickly and reliably,' creators Mirko Kovac and Rob Siddall told Digital Trends." This would be great for taking cool videos. "Two guests at a New Hampshire wedding recently filed a negligence lawsuit against groom Barry Billcliff and wedding planning firm Searles Castle after a quadcopter smashed into their faces during the event. The out-of-control copter caused some pretty nasty injuries, with one of the women suffering a gash to her head that needed 20 stitches to fix, and the other a fractured nose and broken bone around the eye, the Boston Herald reported. The wedding guests had been enjoying themselves on a dance floor under a large tent at the event earlier this year when the drone suddenly came flying toward them." this is why rules are a good idea. you don't want idiots with no piloting experience smashing into people with those 4 whirling blades of doom. Actually, don't let an idiot near a quadcopter. period. "With the new so-called Part 107 rules for commercial drone pilots released in August the FAA opened up the skies – with significant restrictions – to drone photojournalists. Licensed Part 107 pilots are not allowed to fly in controlled airspace, cannot exceed a height of 400 feet above ground level (AGL), cannot fly over people, over traffic, at night, or beyond what is called Visual Line of Sight (VLOS). Other rules – such as giving way to manned operations, or not operating in a reckless manner were also understandably instituted. Some of these rules may be obviated under certain conditions with an approved waiver from the FAA. 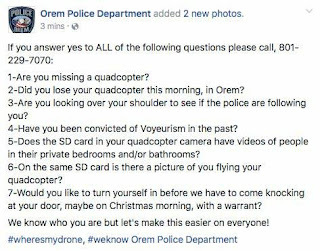 The problem for drone photojournalists is that these very sensible rules can be undermined by a tactic that law enforcement is increasing using to prevent aerial coverage of their operations – the Temporary Flight Restriction (TFR). A TFR is a cutout from spaces where drone pilots – and manned air traffic - would otherwise be allowed to fly – ostensibly in the service of air safety. Drone pilots are not allowed to fly in a TFR zone without a waiver from the FAA." 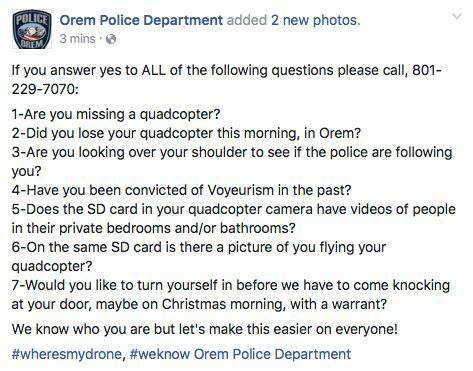 This is all a brand new field of law, but we certainly don't want the police misusing FAA rules to block legitimate news coverage. "We now live in a world where weapons are being created to bring down drones originally intended for aerial photography, or just good healthy fun. I suppose it was inevitable, what with numerous incidents being reported of small personal UAV’s straying too close to aircraft, but I honestly thought we were a few years away from this. I was wrong."